A taiko music world that never existed before. A superb stage mixing the East and the West. This is an evolution of the taiko entertainment! Full of dynamism and rhythm of the Oke Daiko. Overwhelmingly energetic and pop stage. A new taiko entertainment world totally different from other taiko groups. This is the Hayashida world. Still and movement, soft and energetic, slow and fast… it’s a spiritual performance. It comes with special scenes. This comes with two DVDs: Introductory Level and Basic Level. 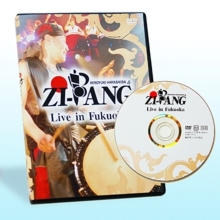 A must-have DVD for Oke Daiko fans and players! 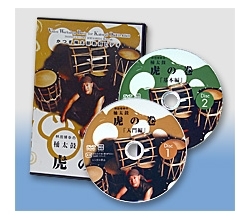 Hayashida introduces how to care Oke Daiko, how to tune it to the theory to basic techniques! Introductory Level: 40 minutes, Basic Level: 120 minutes. Please copy the Order Form below and paste it on your Email or Fax. Please leave inapplicable parts blank. Please indicate any special instructions in the Communication Column. Once your order is confirmed, we will email you the total amount and the shipping cost and an approximate shipping date. We do not respond to e-mails on Saturdays, Sundays and Japanese national holidays. We send it out to the whole country. We are sorry, we cannot the Collect On Delivery. The order to Linden promotion.